The Peter Witt streetcar was introduced by Cleveland Railway commissioner Peter Witt (1869-1948) who led the transit agency from 1911-1915 and who designed a model of streetcar known by his name, and used in many North American cities, most notably in Toronto and Cleveland. 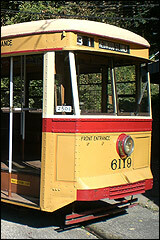 This design was distinguished from other streetcars of the era by its use of the center door as an exit only, with a conductor stationed inside just in front of the door. Passengers could board through the front doors without waiting or paying; they could pay the conductor immediately and sit in the rear of the car (in the nicer seats), or wait in front and pay just before they exit. This had the effect of reducing the car's dwell time at stops, improving schedule times and increasing capacity. Many vehicles were later converted to pay-as-you-enter operation in order to reduce the number of staff needed, but they continued to be known as Peter Witt cars. The Sound Project I developed for my Peter Witt Streetcar includes a variety of sounds recorded from the prototype car at the Baltimore Trolley Museum. Throttle Function keys operate sounds for gongs, doors, passenger buzzer, and route rollup signs. Motor/track sounds are matched to the throttle "notch" and controller sounds are heard as the throttle is advanced or direction changed. Options can be set to sound two gongs automatically at startup (for the lazy motorman). Brake squeal and air release are automatic at stopping. Air Compressor sounds are initiated at selected time cycles as is an automatic passenger buzzer. Farebox coin clinks and voice announcements are randomly issued at door open/close cycles as well as automatic Conductor bells at door close. Track squeals can be played while the car is in motion. All sounds can be muted with a Throttle Function key (F6) and volumes for each individual sound can be adjusted by changing decoder CVs. Digitrax format Sound Projects include software to command the SFX sound decoder, sound clips in the standard Microsoft WAVE file format, and other control information. The Sound Project is loaded into the decoder using Digitrax SoundLoader(tm) software and a PR-2 or PR-3 hardware interface between the decoder and the PC. To read the rest of this article please go to Fred Miller's site located here.